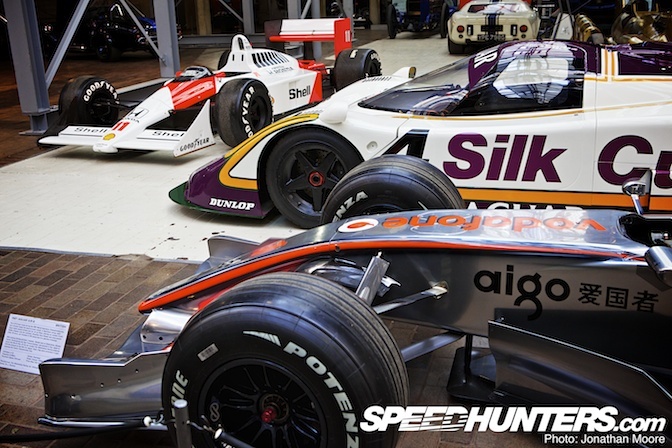 The National Motor Museum at Beaulieu in England has a full-house of Formula One races from across the decades, chronicling the evolution of the Championship in physical form. 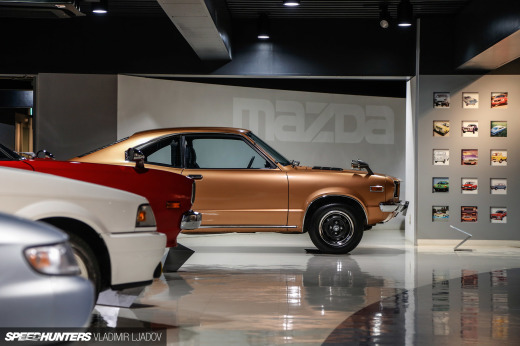 Beginning with racers from the '50s and finishing with examples from the most recent era, some vital cars are included in the collection that would normally only be seen in the hands of private collectors or in the museums of the manufacturers themselves. 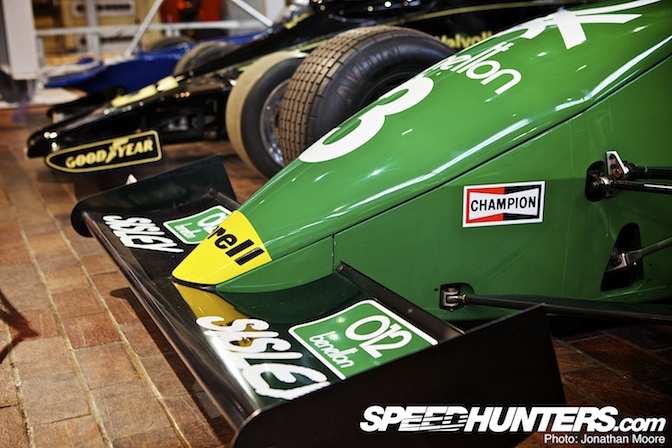 It's what makes Beaulieu such a special place, like the equally impressive Donington GP Collection in the Midlands of England. 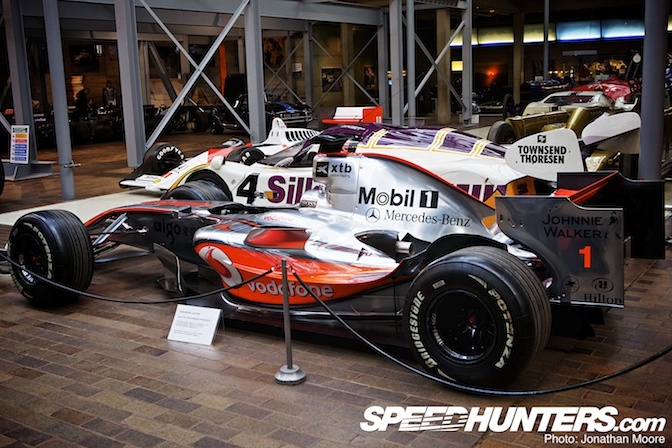 When I visited, the Museum's F1 cars were displayed in three packs representing loose chronological groupings: '50s and '60s, '70s to '90s and the last decade. One of the prizes is this McLaren MP4-4, a sister car to #12 on display at the McLaren Techology Centre in Woking. 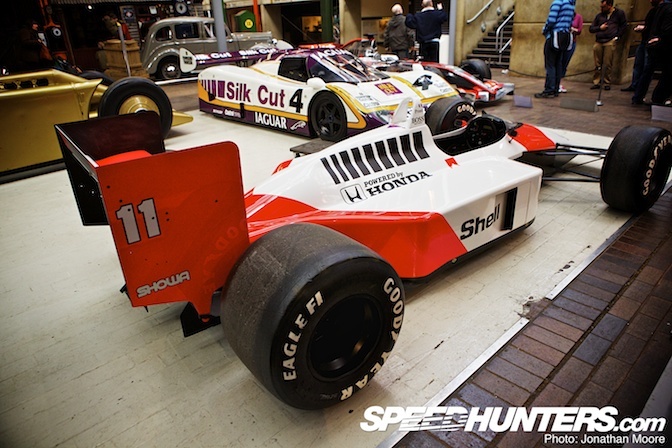 Its day-glow livery provided a focal point for the whole exhibition, and it's a car you can't help but keep going back to. 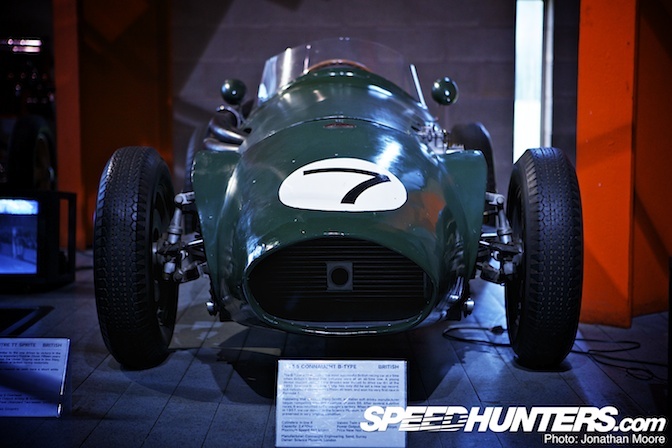 The Connaught B-Type was built in 1955 at a time when Britain's Grand Prix hopes were just only just beginning to be realised: Alfa Romeo, Maserati and the nascent Mercedes Benz and Ferrari teams were the dominant forces; British drivers such as Stirling Moss and Mike Hawthorn were driving well but there was no strong team national team. Connaught Engineering provided the first successful British foray into F1: lead driver Tony Brooks was a dental student by night, but he drove chassis B1 to victory in the 1955 non-championship round in Siracusa, Sicily, setting a new lap record and beating the works Maseratis. The cockpit is seemingly spacious and comfortable, but the driving position is very upright compared to the almost prone position most modern cars have. The most remarkable thing was how soft the seat cushion was: you could push the padding down about six inches! Not exactly a stable environment but typical of F1 cars of the time. This is chassis B6, owned by the Science Museum and on permanent loan to the National Motor Museum. 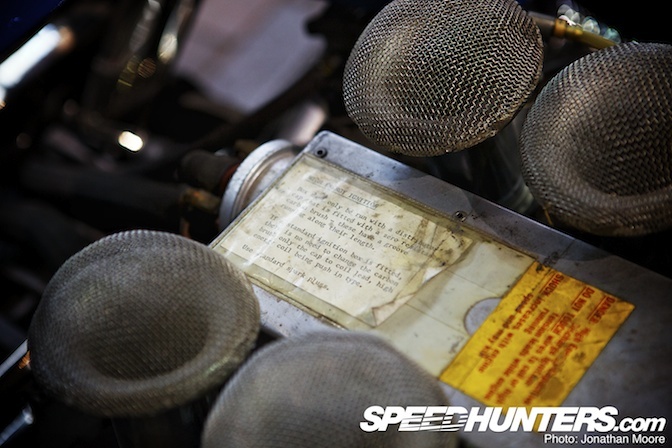 Its 2,470cc 4-cylinder produced 250bhp at 6,700rpm: it was originally designed as an F2 car, but a rules change allowed them to take on the Italians in the top-level championship. Engines were always the weak point of British cars at this time, and it was only the handling and braking of the Connaughts that allowed them to get on terms. Six other B-Types were built – B1 is in Bernie Ecclestone's private collection. Tony Brooks has actually been recently reunited with B6 and driven it at the Goodwood Revival. 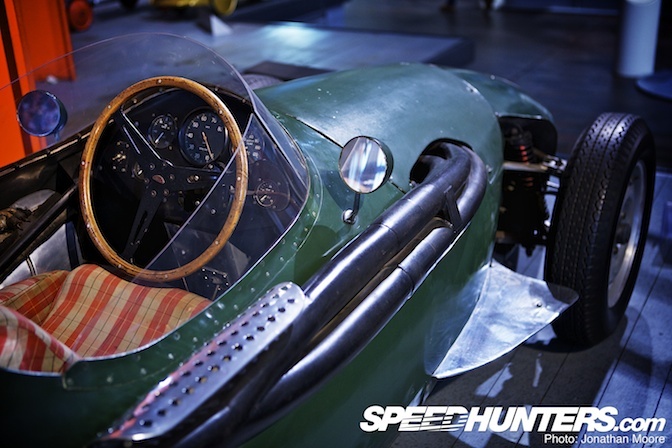 The 1960s are represented by two iconic cars: a BRM and Lotus. I'll look at those cars separately; here we've got a great line-up showing how the cars evolved from the '70s through to the '90s. 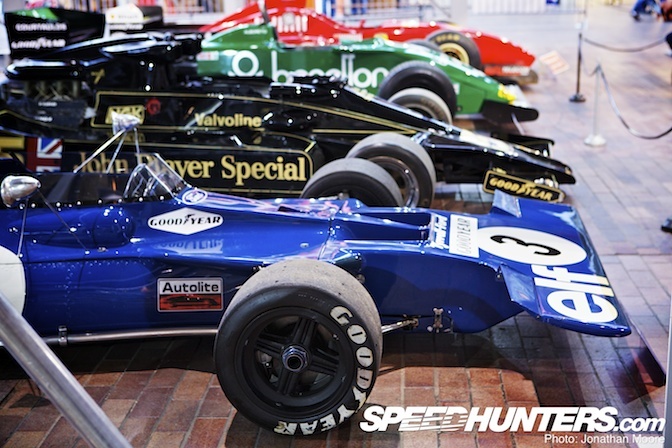 The 1970 Tyrrell-Ford 001 was Tyrrell Racing's first self-produced car after splitting from the French Matra chassis that they'd used to win the 1969 World Championship. They used a customer March-Ford 701 at the beginning of the 1970 season whilst they worked on developing the 001. 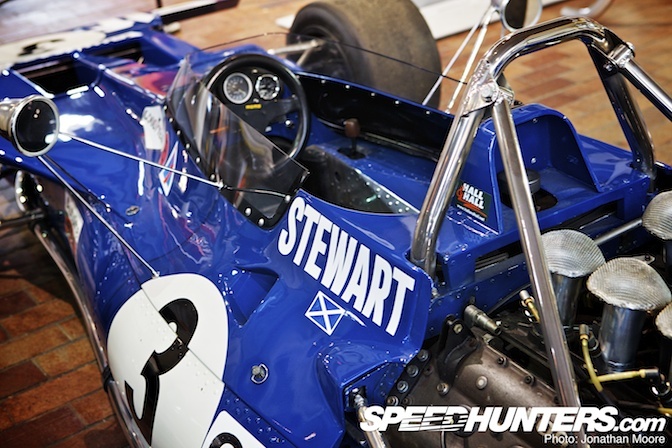 Jackie Stewart, winner of the '69 title, drove the 001 in three outings at the end of 1970, though it suffered from mechanical failures in all three races. 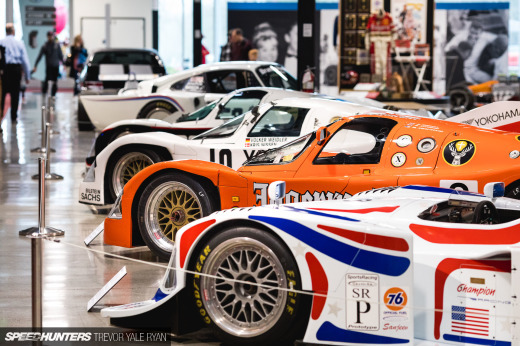 The 003, a development of the 001, won the '71 Drivers' and Manufacturers' titles. It's interesting that this is where Coke-bottle shape monocoque's were first used, a shape that is now synonymous with F1 racers but that fell out of favour for a while in the late '70s. The distinctive raised, hammerhead-style front wing covered the radiator intake, and resembled the MS80 design of their 1969 Matra. Because they retained sponsorship from the French state oil company, Elf, Tyrrell also kept the French racing blue of previous years. 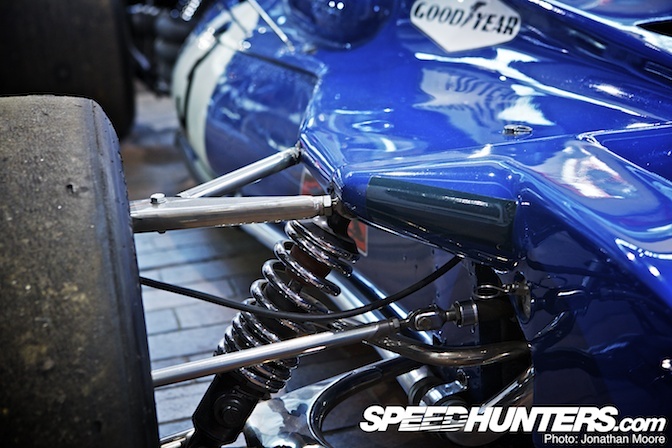 I love the aesthetics of exposed F1 suspension, especially in the classic era with all the beautifully made, bespoke assemblies. 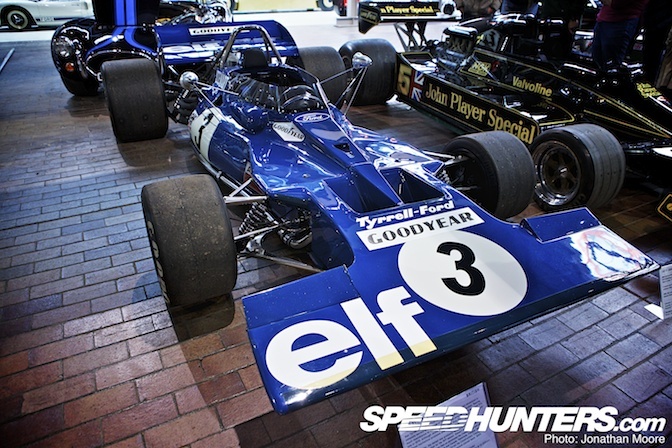 The Tyrrell used double-wishbones with coil springs over dampers at the front, with added trailing arms at the rear. 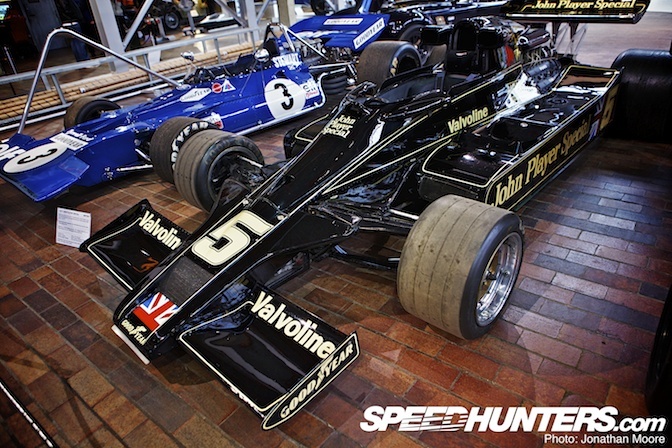 The 001 used a Ford Cosworth DFV (Double Four Valve) 90-degree V8. This legendary aluminium block was the engine to have in F1 for many years. It had been first used by Lotus in 1967, and developments of the engine were still racing in various categories into the mid-1990s. 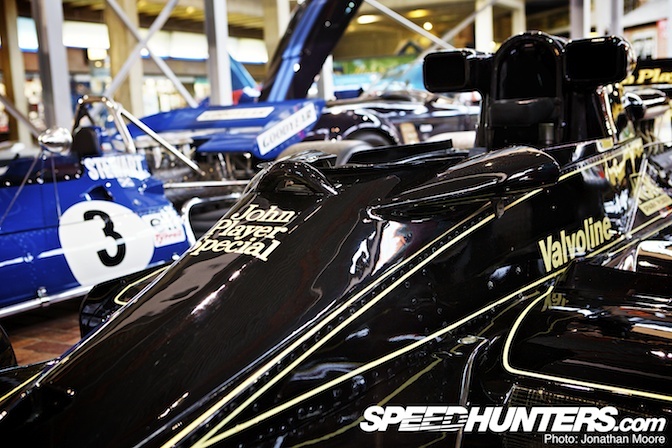 Next to the Tyrrell is another DFV-powered racer, the 1977 Lotus 78 'wing car'. The 3-litre V8 pushed out 465hp at 10,500rpm, with a top speed of 180mph. The 78 actually competed as a John Player Special, representing the increasing influence of sponsorship on the sport. Swedish driver Gunnar Nilsson won the 1977 Belgian Grand Prix in this car, and Ronnie Peterson the 1978 South African Grand Prix. 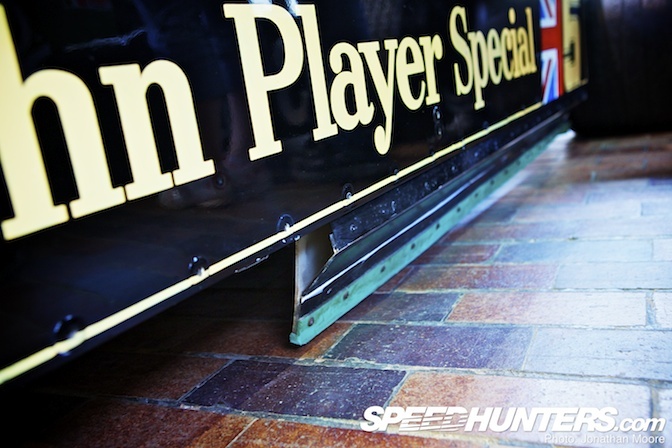 This car was another example of the innovation of Lotus founder Colin Chapman. He had been experimenting with ideas on low drag air penetration and the early principles of fluid dynamics, which confirmed his theory that a shaped underbody and the side pod attachments would massively increase downforce. The side pods were therefore shaped like inverted aerofoils, reducing the air pressure under the car and creating a partial vacuum, sucking the car onto the track. When the '78 was reliable it was almost uncatchable: it scored seven victories across the 1977 and '78 seasons. 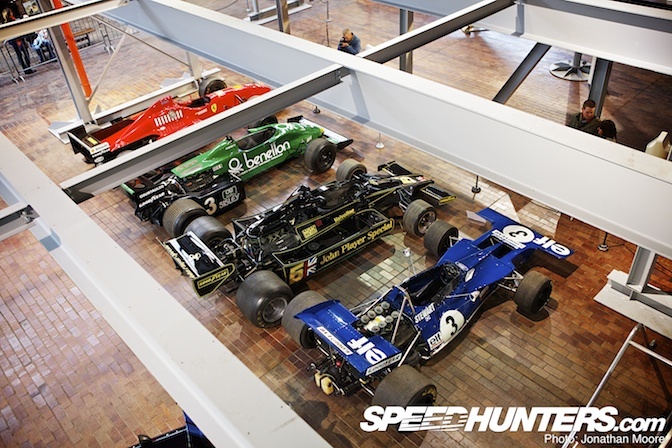 The other two cars in this area are a Tyrrell-Ford 011 from 1981 (a car which scored the last ever win in F1 for a car using the Cosworth DFV, in 1983) and a replica of Michael Schumacher's 1996 Ferrari F310 V10. Come the late 1980s, the age of the turbo beckoned. 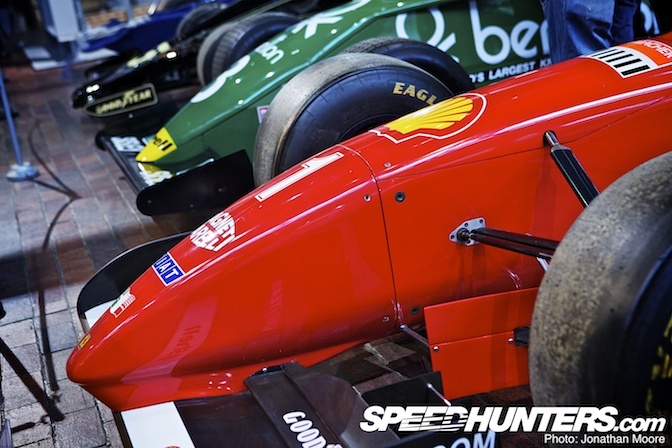 Enormous horsepower, big traction, simple-looking but hugely effective aero: these cars are a generation apart in F1 history. 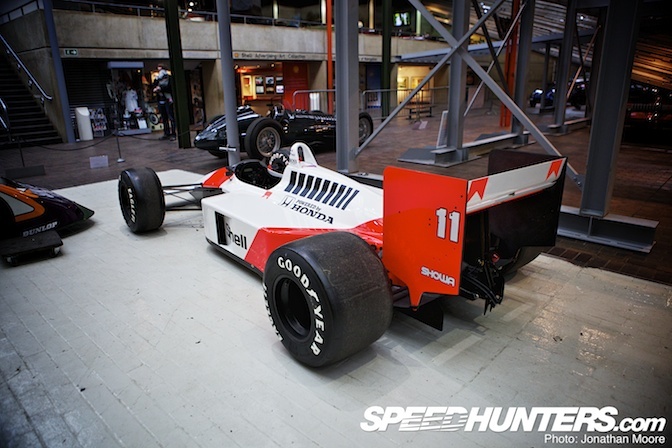 Beaulieu is lucky enough to have MP4/4-6 in their collection, one of six MP4/4 chassis constructed. 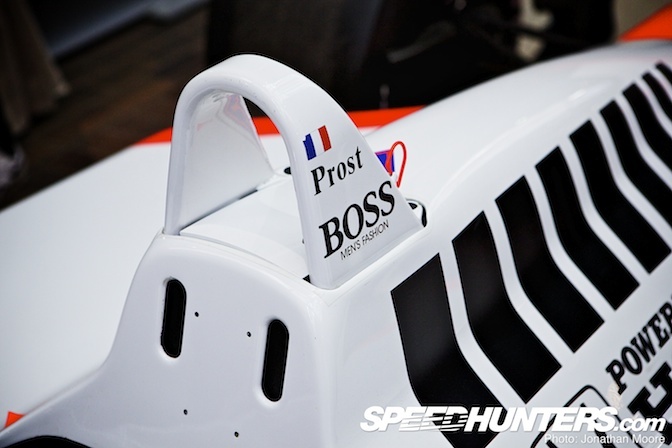 It's liveried as one of Alain Prost's cars from the 1988 season. 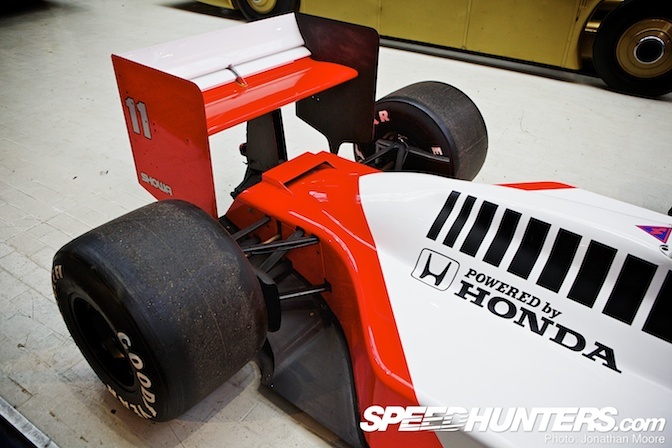 The Honda 1.5-litre V6 Turbo in the MP4/4-6 kicked out 900hp at 12,500rpm, giving a top speed of 195mph. Most of the competition only saw the car from somewhere approaching this angle: between Prost and Ayrton Senna, McLaren cleaned up the championship, winning 15 of 16 races (Gerhard Berger in a Ferrari snatched an unexpected victory at Monza when Senna crashed lapping a back-marker and Prost had retired with an engine failure). The cockpit is still relatively simple, but notice the increasing number of things drivers were expected to keep on top of, such as the suspension setting lever on the left and the boost dial in the top right. It's a beautifully clean car, in contrast to the current era McLaren in the background (more on that further on). 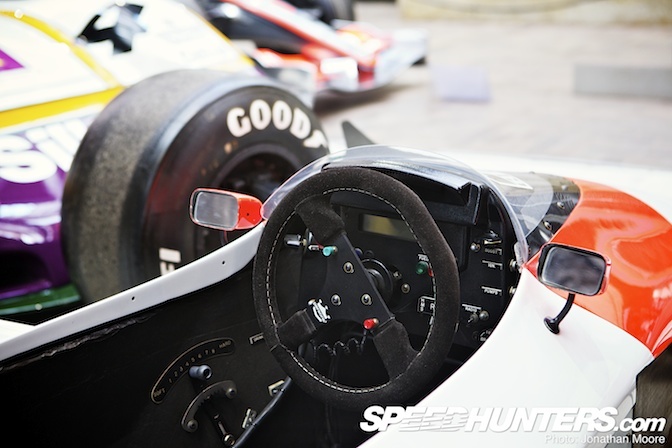 Both Prost and Senna drove this chassis, number 6, in period. Round the corner was Damon Hill's 3-litre V10, 700hp, 220mph Williams-Renault FW18 – he had nine pole positions and eight victories in FW18s on his way to the 1996 World Championship. 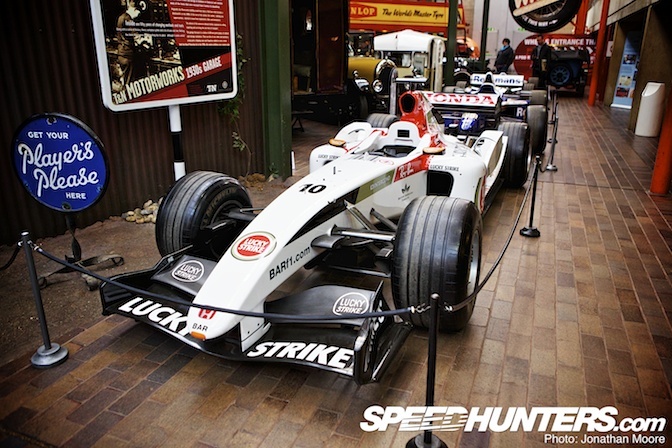 This particular chassis, numbered 02, was his test car for the season and was also raced by Jacques Villeneuve for this first three F1 outings in '96. 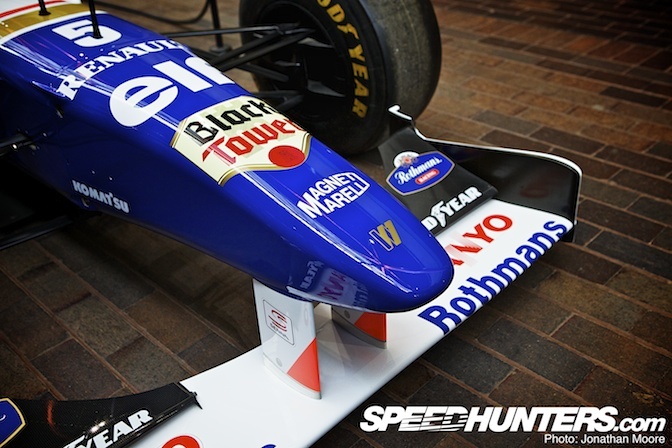 Note the Senna logo on the front wing upright, worn as a mark of respect to the man who was a Williams driver at the time of his death. Takuma Sato's BAR Honda from 2004 was added to the collection in 2009 –Taku's race suit was also loaned to the Museum. The Geoff Willis-designed 006 featured the 3-litre V10 Honda F1 RA004 engine – thought to be the most powerful engine on the grid in 2004 – and this was one of the few years that BAR delivered on their promise. Ferrari still dominated that year, though Jenson Button finished third in the sister BAR and the team finished second in the championship. 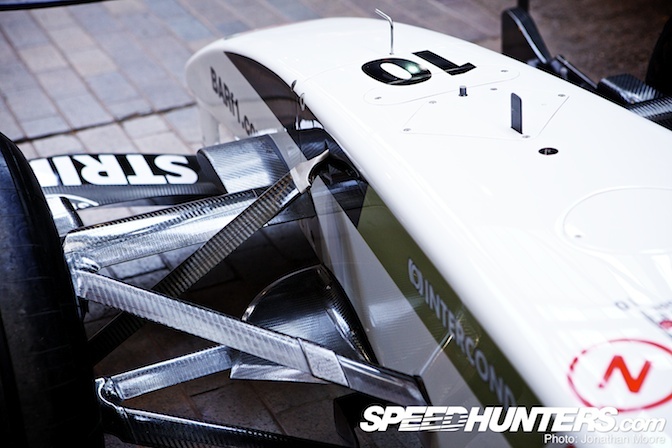 From this angle you can really see the complexity of all the carbon fibre suspension and aero at the front of the car. The BAR006 on display has been liveried to represent the car as it was run at the USA Grand Prix at Indianapolis, the race where Taku scored his first F1 podium and the second ever for a Japanese driver. 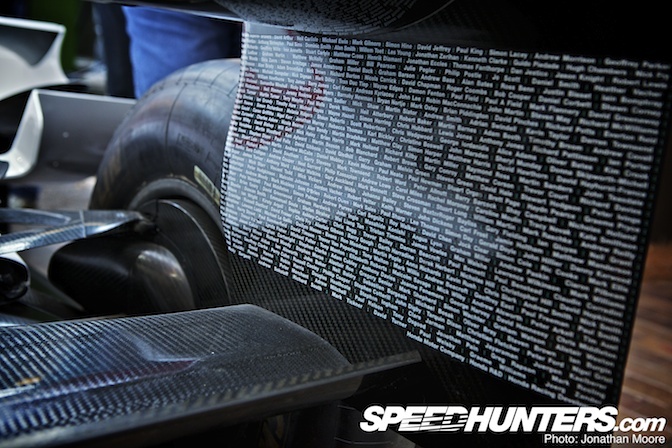 On the rear wing uprights there is a list of all the people who worked for the team at the time. 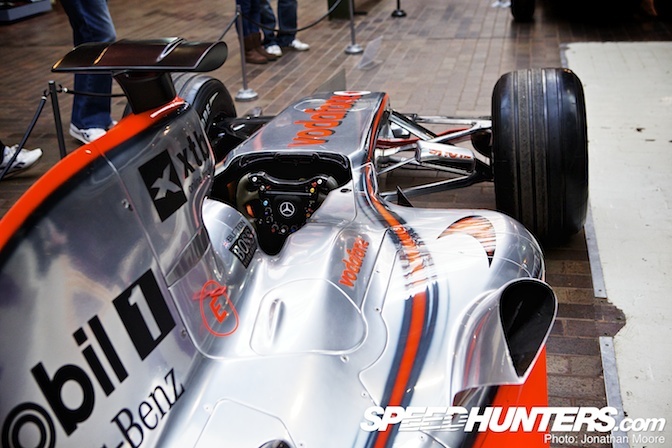 The most modern car on display is this 2010 McLaren Mercedes. Except it's not! 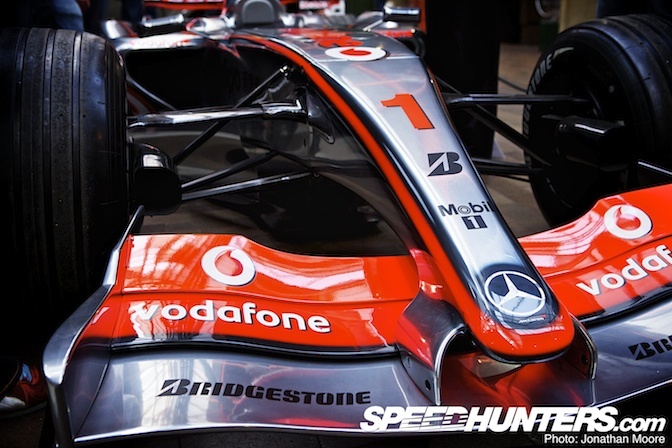 It's actually an MP4/21 from 2006 liveried as Jenson Button's car from 2010, as advertising contracts mean that recent McLarens have to be displayed with the current set of corporate sponsors. Rather tedious, but there you go. Whatever, it's still an interesting car to see in the flesh. The aerodynamic complexity of modern F1 is obvious, and the swooping, curvaceous bodywork impressive if not beautiful in the way that the more asethetically pure MP4-4 is. The tapering, ant-eater-like nose is the most identifiable feature of this car, especially in relation to the huge snow-plough of a front wing. 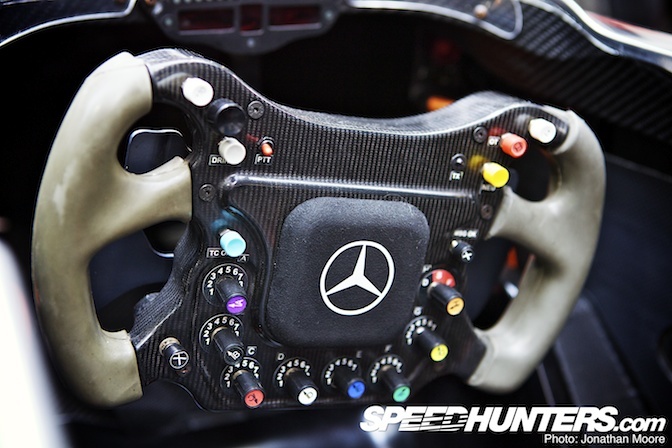 Our final steering wheel for comparison: predominantly letter-only identification for the controls so competing teams don't have a clear picture of what does what, a riot of dials, switches, buttons and paddles. 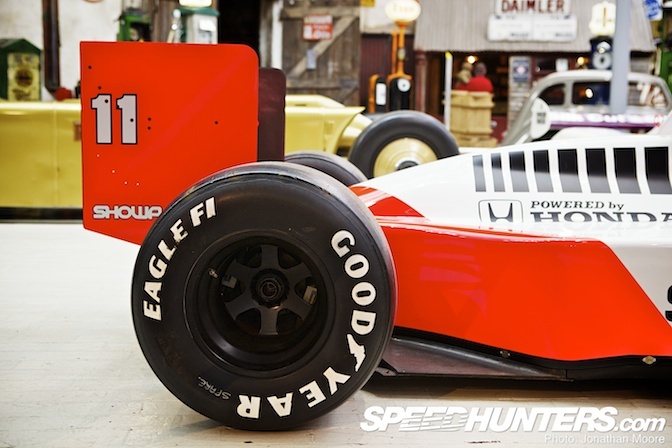 It's no wonder that when Lewis Hamilton drove Senna's MP4-4 it ticked off one of his dreams: you get the idea that the F1 cars of the '80s were just a lot more alive somehow – the engineering is just not as visible. On the subject of iconic cars, next up I'll have a couple of Car Spotlights, including the Lotus 49. Nice article! I'm waiting for the Car Spotlights!!! Jonathan, I always love reading your articles! 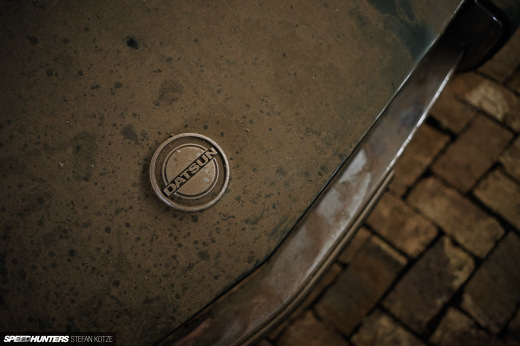 Always great photography and writeup. Thank you. With the new engine changes coming in the near future I hope we have a second turbo era. The 1980's for F1 & WRC racing were really my favorite generation. 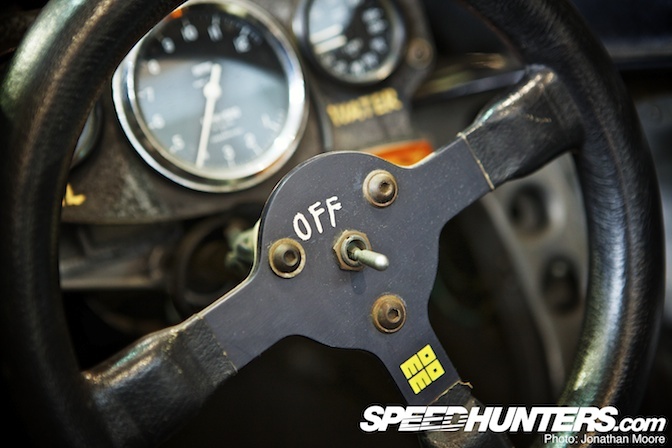 My list of places to see are ever expanding thanks to the speedhunters website. I have mixed feelings on chapman. He was brilliantly mad at times. He was an innovator though. Maybe you are a top gear fan Mr. Moore I loved seeing Hamilton drive Senna's car too. On a side note, the Silk Cut Jaguar is nice. Wouldn't mind a spotlight on it. Beautiful pieces of engineering and technology. Fantastic article. Hoping to a few more from this collection. Love love the fabric on the seat of the Connaught! 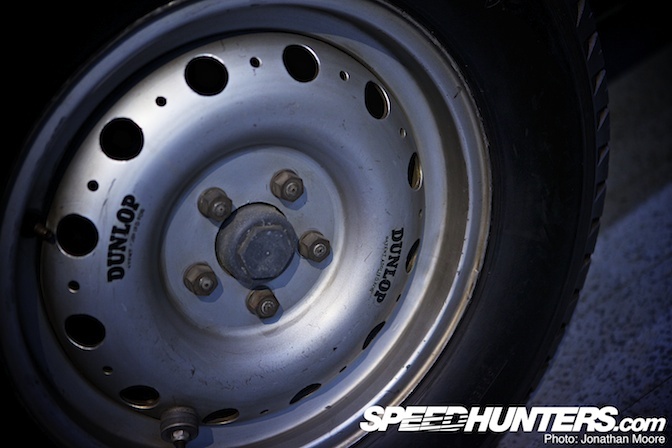 Also what is the bolt/nut/washers getup on the lower part of its wheel? A balance weight? I have such a soft spot for that JPS livery...Very cool post, look forward to the features.